Ahhhhh printers, I am convinced life would be better without them (I don’t even have one at home). None-the-less, printers are a staplemate of businesses across the globe and as SysAdmin’s it is our job to ensure clients have access to the printers all while making it as seamless as possible. 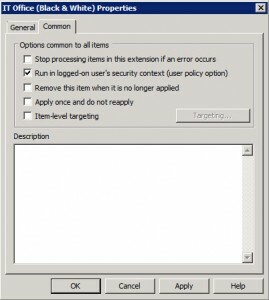 Over the seven years I have been at my current place of employment, I have gone from deploy printers via KIX script (more or less net use with variables) to Group Policy and finally Group Policy Preferences. Despite using 3 different methods not one has worked satisfactory… that is until now. Before I get into the Group Policy deployment side of things I will first give you an idea of the environment I am working with. 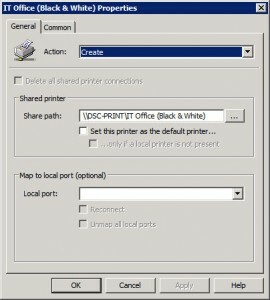 The three important bits is the Action is set to Create, Share path is set to the SMB share path of your printer (use the … button to browse and point the printer if you do not know the path from memory) and that Run in logged-on user’s security context (user policy option) is ticked. Now according to Microsoft, all that is left is to apply the policy to your choice of Organisational Unit and you should have printers being deploy left, right and centre. Depending on your environment this could be true however in our case this is not enough. If it is not obvious already the above to settings will allow standard users to install printer drivers. Makes sense right? With the above applied, all 30+ printer queues came through. With this many printer queues, logon times are significantly increased upon first logon to a machine while the drivers are pulled from the Print Server and installed. 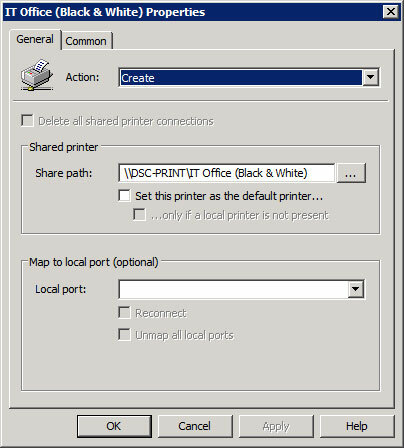 On shared machines this can be frustrating to the end user (1:1 machines aren’t affected as subsequent logins do not have to reapply the policy unless there is a change) so my next task is to test if deploying the printers in Computer Configuration rather than User Configuration will only install the printers upon first domain user login and any subsequent domain user login will use the existing drivers/configuration. Now go forth and give them all the printers they can handle! Great article! Really helps explain deploying printers via GPP in a well written and clear to understand article. move around to different offices. the different parts of our head office. Just had a look through your article Ivan and it’s a great piece. Definitely a must do for those with many branch offices. Unfortunately in my environment, all our printers are on the one VLAN and each Lab has its own VLAN (to minimise broadcasts and cross-chatter) so subnet-based locations wouldn’t work to well (based off the printer). None-the-less a fantastic write up. I shall share across my networks. Thanks for the reference. Very appreciative! The subnet-based locations actually worked off the client, not the printer. So in an environment where each lab has its own VLAN, you would configure the GPP to set the registry key of *LAB1* with Item Level Targeting of Subnet 192.168.1.x (example). Well that’s perfect then! I don’t have access to GP at the moment so I couldn’t confirm (only presume). Regarding mobile clients, I am positive Server 2012 introduced location-based printing support that could help with this. Might be worth checking out and adding to the post?